Everybody knows somebody with a bad temper. And if you're a fan of comic books, or superheroes in general, the first thing the phrase "bad temper" will bring to mind is most likely the Hulk. The destructive alter ego of scientist Bruce Banner, the Hulk was unleashed upon the world by creators Stan Lee and Jack Kirby in 1962. His comic wasn't exactly a hot seller at first, and was actually cancelled after only six issues. He made occasional guest appearances in other comics for a while, but by 1964, Marvel Comics had caught wind of the Hulk's popularity with college students and gave him a co-starring role in their Tales to Astonish comic. He gained even more recognition through Tales to Astonish, so much so that Marvel actually changed the name of the book to The Incredible Hulk in 1968. But it took another ten years after that for the Hulk to become a true household name, which happened when a live-action television series focusing on the character debuted on CBS in 1978. Starring Bill Bixby and Lou Ferrigno, the series  bearing the appropriate title of The Incredible Hulk  has remained a cult classic and still defines the character in the eyes of many who don't read comics. So influential was the television series that when Ang Lee's cinematic adaptation of the character hit theaters in 2003, people were less than enthused. People were expecting either an adventure in the vein of the show, or a straightforward action movie where the Hulk spends the entire movie smashing things. Instead, we got a drama featuring existentialism, poodles on steroids, and incredibly unconvincing CGI. It wasn't necessarily a bad movie, but it was no great shakes, either. It just wasn't the type of Hulk movie that anybody wanted to see. So when Universal Pictures gave the go-ahead to another Hulk movie, the decision was made to completely reboot the franchise and let Marvel themselves handle the movie's production. The movie drew its inspiration from the TV series, right down to sharing a name. And the truth is that it's a better movie for it. Bruce Banner (Edward Norton) was once nothing more than a mild-mannered scientist. That all changed when, while working on a top-secret project for the United States military, he suffered an accidental overdose of gamma radiation. Instead of killing him, the exposure to the radiation instead causes him to involuntarily transform a violent green-skinned leviathan dubbed "the Hulk" whenever he loses control of his emotions. Thanks to the wanton destruction created by his Hulk persona, Bruce has spent the last five years as a fugitive. After spending half a decade hiding from General Thunderbolt Ross (William Hurt) and the Army, Bruce has finally found a little bit of peace. He's gotten a job at a soda bottling plant in Brazil, and with meditation and training in martial arts, he's gone 158 days without becoming the Hulk. He's also spent his time searching for a way to stop himself from ever transforming again, hunting for an antidote with the help of Samuel Sterns (Tim Blake Nelson), a scientist with whom Bruce has been anonymously corresponding online. But when an accident at the bottling plant results in someone being stricken with gamma radiation poisoning, General Ross follows a trail of clues right to Bruce. He sends in a team of soldiers to capture his quarry, but the ensuing chase provokes an appearance from the Hulk. 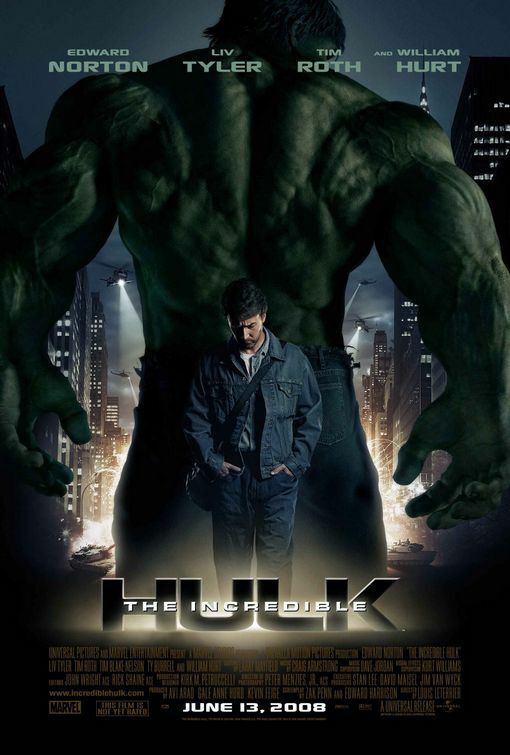 The Hulk tears through the soldiers and escapes, leaving only team leader Emil Blonsky (Tim Roth) behind to tell the tale. A rattled Bruce flees back to the United States soon thereafter, hoping to find more data regarding his condition and help Sterns's search for a way to suppress his monstrous alter ego. His search leads him back into the life of former flame  and General Ross's estranged daughter  Betty (Liv Tyler). Their happy reunion doesn't last too long, however; Betty's boyfriend Leonard (Ty Burrell), concerned for the safety of both Bruce and Betty, has led her resilient father straight to them. Though the Army has yet to figure out a way to defeat the Hulk, they've come up with a new plan. Blonsky has volunteered to take controlled doses of a military-developed "super soldier" serum, an experiment that General Ross hopes will enhance him into someone who can stand toe to toe the Hulk. As a reconnected Bruce and Betty try travelling to Sterns's laboratory in New York City, they must evade General Ross's soldiers and an increasingly aggressive Blonsky, who the serum treatments are quickly rendering more monster than man. The Incredible Hulk might not bear the sophistication of similar movies, but it's nothing short of fun. And I can't speak for anybody else, but in my eyes, being fun can go an awfully long way. It's the complete mirror opposite of Ang Lee's depiction of the Hulk, forsaking much of the angst-filled soul-searching that comprised the previous movie for a greater emphasis on action, adventure, and wanton destruction. And with Bruce Banner's struggles to find a cure, the movie is a spiritual successor to that classic television show, embracing it to the point of nearly being a stylized remake of the show. Borrowing trace elements of both the television show and the previous movie, this new telling of the Hulk's story has a particular aura of familiarity that makes it easy to jump into once things get rolling. The movie definitely has a more action-oriented tone, which is thanks to director Louis Leterrier. Leterrier is no stranger to action, having directed Unleashed and the first two Transporter movies. And while The Incredible Hulk is a thoroughly different kind of action movie, Leterrier shows he knows how to craft a great action sequence no matter who the participants are. Teaming with cinematographer Peter Menzies, Leterrier has crafted a sleek, stylish movie that never fails to lose the audience's attention. Admittedly, the action scenes are primarily accomplished with CGI (which is drastically improved over the unrealistic, cartoony-looking effects from the previous Hulk movie), but Leterrier still manages to keep a handle on things. But it's during the non-action scenes where Leterrier and Menzies really get the chance to shine. The movie boasts some very awesome camera setups thanks to Menzies, and Leterrier crafts these scenes in such a way that's quite engrossing. Assisting in that is the fantastic score composed by Craig Armstrong. Armstrong's music does a fine balancing act between Bruce Banner and the Hulk. The music has a sense of urgency and melancholy with Banner, whilst becoming more ferocious with the Hulk. Armstrong even manages to work in the old television show's theme song in a way that totally fits, something that I can say about the music as a whole. Next on the list is the screenplay. It's credited solely to Zak Penn, but from what I understand, Edward Norton made some significant contributions as well. He doesn't receive an on-screen credit if he did, so maybe there's some kind of union restrictions in place or something like that, I don't know. Regardless, I didn't have any problems with the script whatsoever. Yeah, it's got the obligatory "Hulk Smash!" moments, but ultimately, it's a chase movie. The military is chasing Bruce Banner, and Banner is chasing a way to return to the normal, peaceful life he had before the Hulk. There's also the fact that, like any good hero/villain combination, Banner and Emil Blonsky are mirror opposites of one another. Banner was stuck in an accident that created the Hulk; Blonsky becomes the Abomination on purpose. Banner wants to completely destroy the monster within him; Blonsky wants as much of that power as he can get. I will admit that they did try to do something similar with the previous Hulk movie, but its utter failure ultimately makes the attempt here look that much better. Granted, the effort here is already pretty darn good. But you know what I mean, right? Last up to bat is the acting. In the lead role, Edward Norton is quite an improvement over Eric Bana. The characters are interpreted similarly, but with Norton's version taking a more proactive role in trying to quell his alter ego, it means he can put forth a completely different performance than the one we saw in 2003. Norton is very good in the role, playing Bruce as if he is not afraid of the Hulk, yet worries he will never be able to control it. As with a lot of the movie's other aspects, his performance feels evocative of Bill Bixby's work on the old television show. You really get the sense that Norton's Bruce has lived with his situation long enough that he's resigned himself to the fact that he may never be able to get rid of the Hulk, but still tries to do it anyway. Norton is really convincing, and I really appreciated his efforts. I also thought that Tim Roth's work was well done. The character is depicted as an aging soldier who wants Hulk's power for himself to circumvent the fact that he's past his prime, and Roth really does a great job in showing Blonsky's growing obsession with the not-so-jolly green giant. He makes you believe he's the character, which is probably the best compliment I can give him. The rest of the supporting cast also put forth performances that better the movie. Liv Tyler is likable, and she and Norton have a believable chemistry that makes things work. William Hurt was also good in his role, effectively playing General Ross as the stubborn military man he needs to be. Meanwhile, Ty Burrell appears in the movie as Leonard Samson, who's stepped in as Betty's boyfriend in Bruce's absence. Though the majority of Burrell's scenes were cut from the movie, he's good when he does show up. But my favorite performance comes from Tim Blake Nelson. He's really funny and energetic, and you can't help but enjoy his enthusiasm. All in all, The Incredible Hulk is a thoroughly entertaining movie. I've been making comparisons between this movie and other adaptations of the Hulk throughout this entire review. Maybe those comparisons have been fair, maybe they haven't. But even as a stand-alone flick, The Incredible Hulk still holds up as 112 minutes of nonstop fun. My only true complaint is that I'd have saved Robert Downey Jr.'s cameo for a surprise after the end credits, just so the movie proper could have ended on a bigger punch. But that's an incredibly minor nitpick that really isn't enough to change my view of the movie. I enjoyed the movie quite a bit, so I'll definitely give The Incredible Hulk four stars and a big green thumbs up.